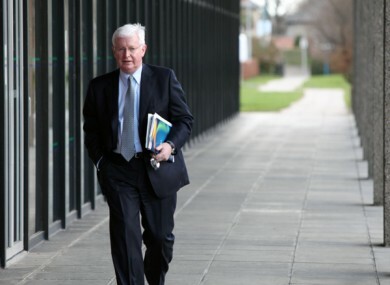 Angela Kerins has told the Public Accounts Committee she is unwell, but Frank Flannery says he simply can’t help. Former Rehab director Frank Flannery. THE DÁIL’S PUBLIC Accounts Committee will hear from the management of the Rehab Group today, but the two people they had hoped to hear from won’t be there. Former CEO Angela Kerins and former director of the charity Frank Flannery have both rejected repeated calls for them to appear at the committee. The PAC hopes to discuss the spending of around €83 million of HSE funding at the charity. Kerins has told the PAC that she is unwell and will not be able to attend. In a letter sent to the committee by her solicitors, Kerins also says that she had previously answered questions for over seven hours. Kerins also said that she had not been correct when she told the PAC that her salary hadn’t been reduced this year. While PAC members sent a letter to Kerins saying that on her recovery it hopes that she will answer questions, the tone in a response to Flannery was decidedly more combative. Flannery had told the committee that as a private citizen, who was no longer in charge at Rehab, he was not in a position to help. The PACs reply letter to Flannery is extremely critical: it says that Flannery’s reasons for not attending the PAC are “nothing short of contemptible”. It says that Flannery’s suggestion that PAC members had a political agenda against him was “very serious and utterly unmeritorious accusations”. Both letters end by saying the PAC will continue to examine the entire Rehab matter and may require more evidence from both Flannery and Kerins in the near future. Email “Rehab management are at the Public Accounts Committee today - but Flannery and Kerins won't be there”. Feedback on “Rehab management are at the Public Accounts Committee today - but Flannery and Kerins won't be there”.